After spending 9 months at Simunjan (see last post), Alfred Russel Wallace made a shorter exploration of Bukit Peninjau, a small hill (1,646 feet high) some 20 km, as the bird flies, from Kuching town centre. He was initially accompanied by Sir James Brooke, the Rajah of Sarawak, whom he had met in Singapore and who maintained a small cottage on this hill. ‘Rajah’ was a grand job title, but Brooke had only been granted the role by the Sultan of Brunei some 14 years earlier and Sarawak was still in its rudimentary stage of development. As such, think of the cottage as more of a wooden shack than a palace. Wallace stayed at the cottage from 13–20 December 1855 and between 31 December 1855 and 19 January 1856. White Rajahs of Sarawak. James Brooke is the one of the left. He ruled from 1841 until his death in 1868. Two of his successors and descendants were Charles Johnson Brooke (1868 – 1917), right, and Charles Vyner Brooke (1917-1946), centre. Wallace would have approached the hill by river, disembarking at the jetty where the village of Siniawan now stands. The quaint village of Siniawan, with its single street of old wooden shophouses, holds a night market every weekend drawing tourists and locals from nearby Kuching. The wooden houses look old enough to have been around in Wallace’s time but are apparently only 60 or so years old. Langsats are tasty fruit but will make your hands very sticky as I found out once while eating them in a cinema in Hong Kong. Local government officials announced a few years back an intention to promote Bukit Peninjau (also known as Bung Muan and Gunung Serumbu) as a tourist destination and at least the place is signposted. Sign pointing the way to Bukit Peninjau, the hill in the background, which is considered sacred to the Bidayuh community. My trip to the hill was unfortunately a bit of a wash-out. The sky looked fairly bright as I approached the foot of the hill. But as soon as I parked my rental car the heavens opened and the hill disappeared behind the clouds. I took shelter under the eaves of the Tourist Information Centre. Here you are supposed to be able to hire a local guide for RM50 to take you up the Wallace Trail but the place was locked and there was nobody around. Visitors are advised not to go alone but having no other choice, I dropped my contribution into the donations box and set off up the hill once the rain had eased off somewhat. There is a map with estimated climb times. According to their estimates it should take nearly 4 hours to reach the peak. There were quite a lot of arrows pointing the way which was reassuring but the path itself was overgrown with dense foliage which I dislike (I would make a very poor Wallace being scared of snakes, spiders and other creepy crawlies!). Bamboo Bridge. Illustration from The Malay Archipelago. Wallace was impressed with the versatile qualities of bamboo and the ingenious ways in which the local tribesmen put it to good use. In this chapter of The Malay Archipelago he wrote about bamboo bridges and I was pleased to see this example of one at Bukit Peninjau. The wooden hut here is similar to ones I have seen in Peninsular Malaysia used as watch houses to guard over valuable durian trees during the ripening season. It might perform the same purpose here. I was amazed to see a similar ladder in almost the same location 160 years after Wallace’s time, the only difference being that they now use blue plastic twine to secure the pegs instead of strips of wood bark. By the time I reached Batu Tikopog, a rock with an unusually smooth cleft, the rain started to intensify with thunder and lightning in the air. I decided to abandon my trek to the peak since visibility would have been zero. It’s a shame I didn’t manage to see the site of Brooke’s cottage either. Nothing remains of the cottage now except an indistinct clearing in the jungle. Plans to rebuild the cottage were announced a few years ago but nothing yet seems to have happened. Perhaps I’ll revisit one day once the cottage has been rebuilt. After Christmas in Kuching, Wallace returned to Bukit Peninjau, this time accompanied by his English assistant and a Malay servant. The hill is still teeming with insects. Most of Wallace’s moth collecting took place at night but even during the daytime this place has some of the noisiest bugs I’ve ever heard as this ten-second video attempts to show. When I was at Sarawak in 1855 I engaged a Malay boy named Ali as a personal servant, and also to help me to learn the Malay language by the necessity of constant communication with him. He was attentive and clean, and could cook very well. He soon learnt to shoot birds, to skin them properly, and latterly even to put up the skins very neatly. Of course he was a good boatman, as are all Malays, and in all the difficulties or dangers of our journeys he was quite undisturbed and ready to do anything required of him. He accompanied me through all my travels, sometimes alone, but more frequently with several others, and was then very useful in teaching them their duties, as he soon became well acquainted with my wants and habits. He was less glowing about Charles Martin Allen who was just a teenager when Wallace took him to South East Asia as his collecting assistant. In his letters , Wallace complained about Allen’s carelessness and inability to learn. Of all the Wallace trails I have visited so far this one is perhaps the most interesting and is fairly easy to access from Kuching. Pity about the weather though! Try to go on a dry day and see if you can get hold of a guide. A map showing the location of Bukit Peninjau appears on my previous post about Wallace. To read about another trip up Bukit Serumbu in Wallace’s footsteps, this one in 1912, see here. 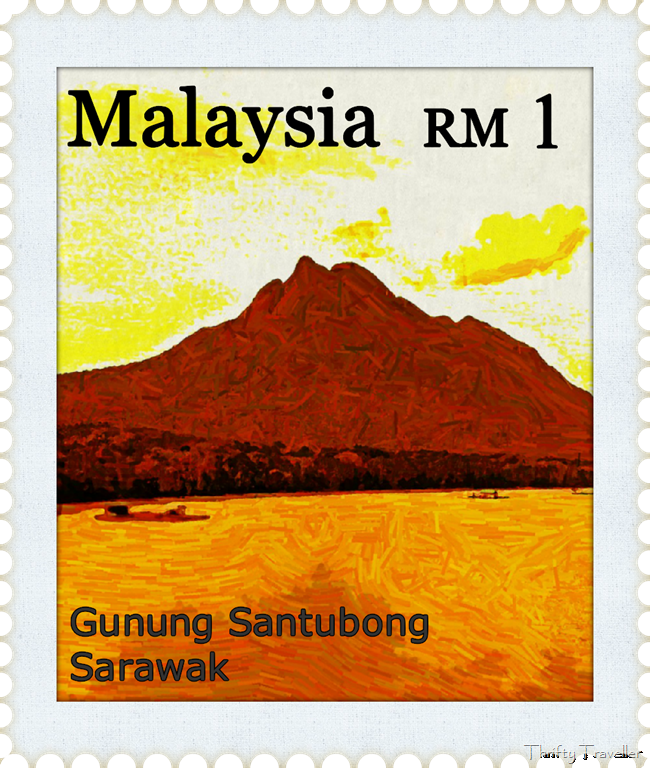 Gunung Santubong is an 810m high mountain located about 35km north of Kuching, Sarawak. Like many Malaysian peaks, it is associated with legends, this one involving a heavenly princess who was transformed into a mountain. Viewed from afar, the profile of the mountain is supposed to resemble a woman lying on her back. I can’t see it myself. From this angle it looks more like the face of Homer Simpson. 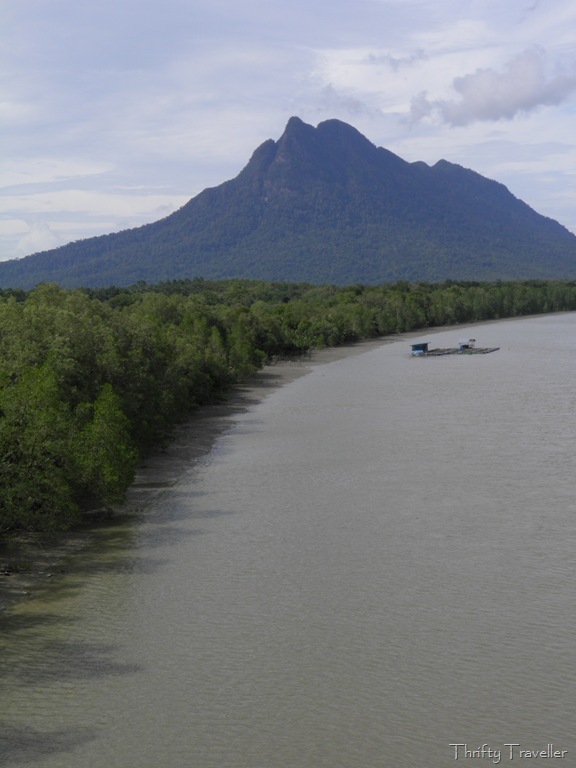 The mountain is surrounded by jungle, mudflats and mangrove forests. 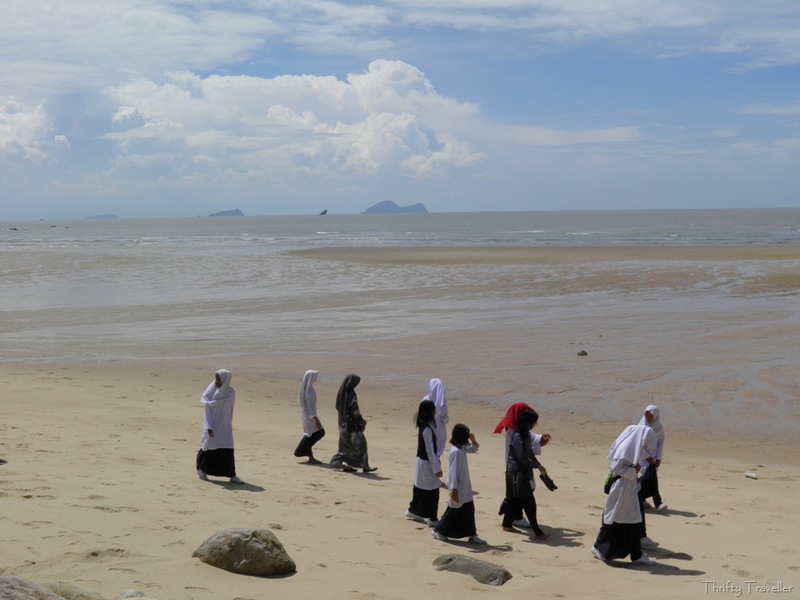 Kuching’s best beaches are found here and dolphins and porpoises have been known to frequent the waters. The fit and adventurous can try climbing this hill. It’s harder than it looks. The summit trek involves an energy-sapping climb with lots of rope ladders and scrambling up steep slopes. It can take anywhere between 2 1/2 and 4 hours to ascend, depending on fitness levels and the number of stops, and up to two hours to come down. The trail starts at the Green Paradise Seafood Restaurant, about 5 minutes walk from Damai Beach. Those not wishing to go to the top can just take the easier jungle trek or visit the waterfall. 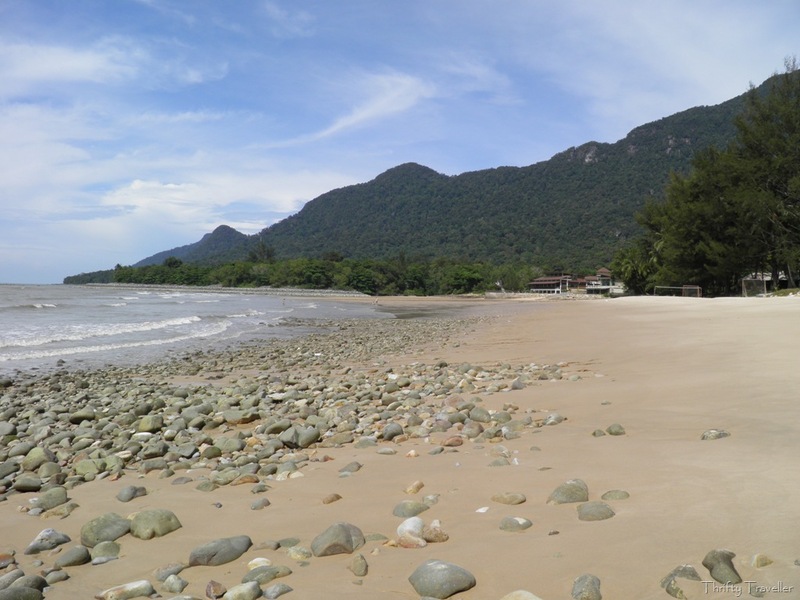 Damai Beach is a fine sand beach with a beautiful setting at the foot of the mountain. It can be prone to jellyfish at certain times of the year but during my recent visit the sea was very swimmable. 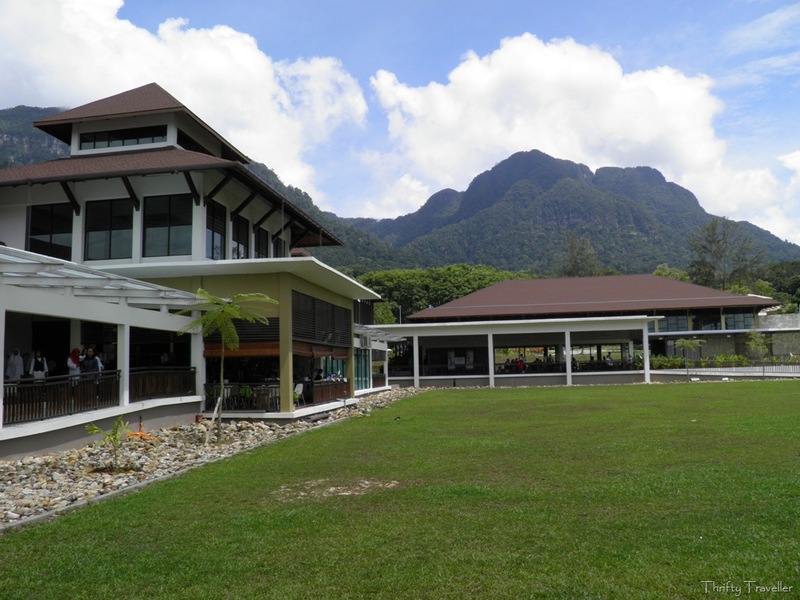 The beach is shared by the Damai Beach Resort and the newly opened Damai Central, a public beach-front shopping, eating and entertainment complex. The retail outlets in Damai Central are not yet fully occupied but it looks like a good facility and it allows public access to the beach which otherwise might have been turned into another exclusive beach resort. 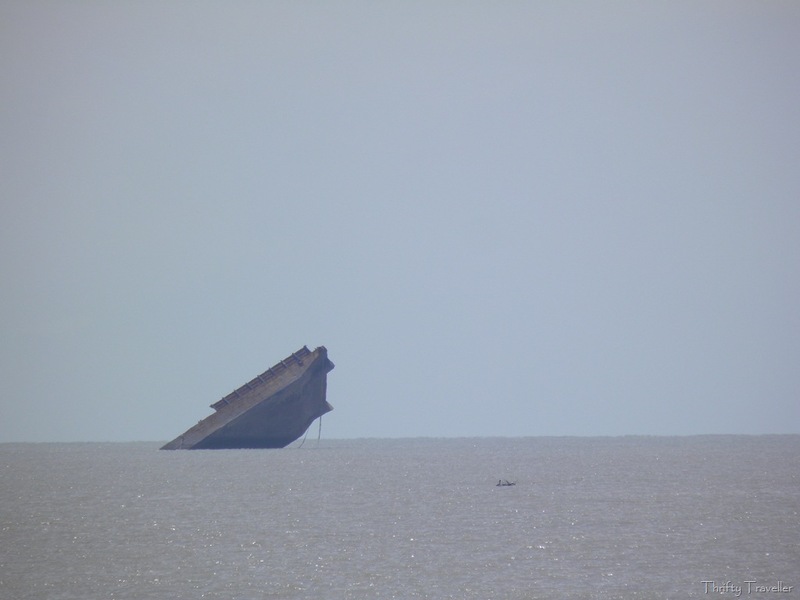 Noticing something unusual on the horizon in the above picture I zoomed in to see what looked like a wrecked barge. 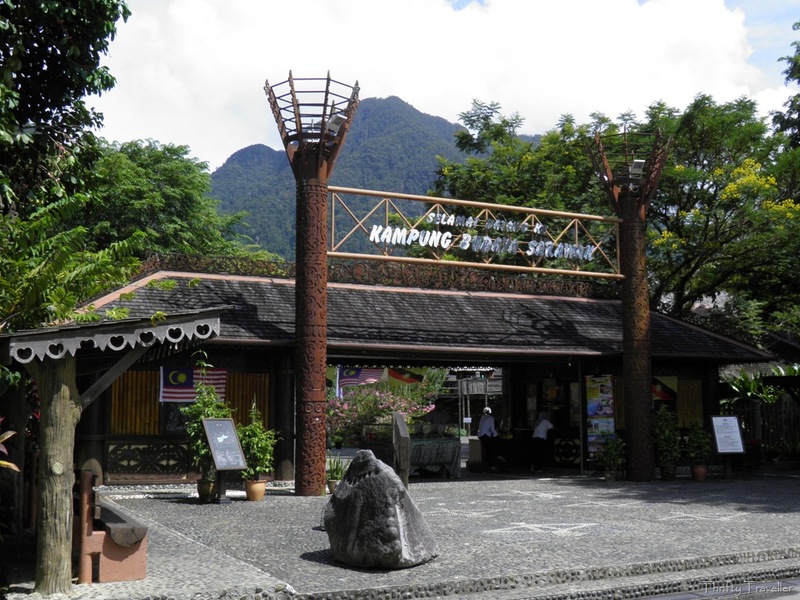 Also at Damai Beach is the entrance to one of Kuching’s top tourist attractions, the Sarawak Cultural Village. 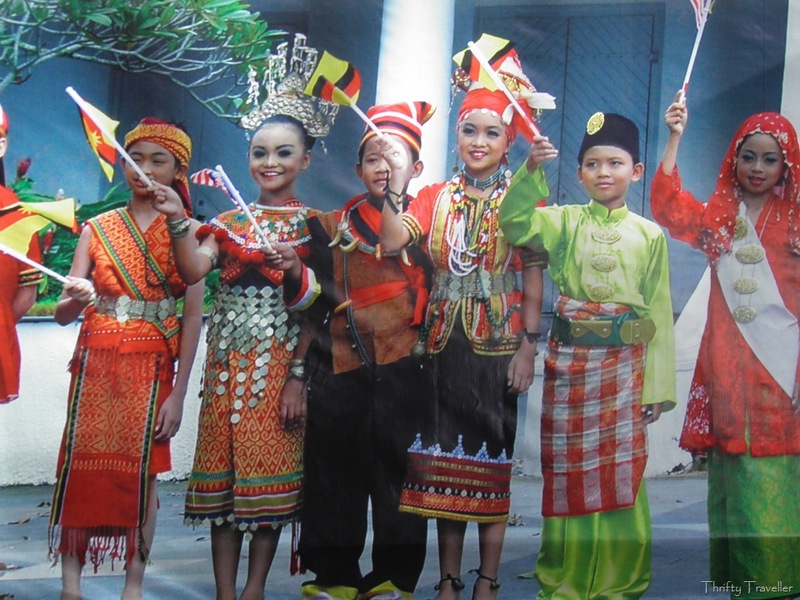 This 17 acre living museum is home to 150 people wearing traditional costumes who show visitors around replica longhouses from all the main ethnic groups of Sarawak and demonstrate their culture and lifestyles . It might not be the real thing but it seems authentic enough for most tourists and it sure is a convenient way to get an overview of Sarawak’s people all in one location. How do you like my postage stamp design? Perhaps I should ask the Post Office for a job. 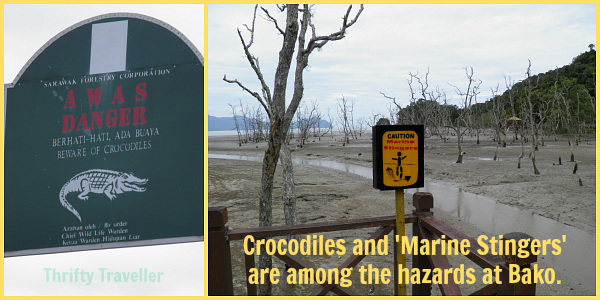 I went to Kuching in Sarawak this week where, among other places, I visited Bako National Park. 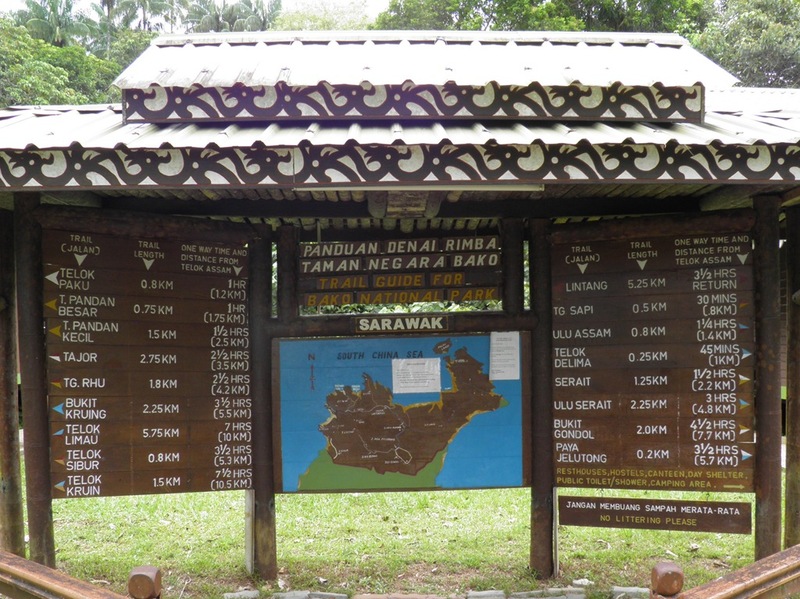 It is the oldest national park in Sarawak (since 1957) and one of the smallest covering an area of 2,727 hectares at the tip of the Muara Tebas peninsula. 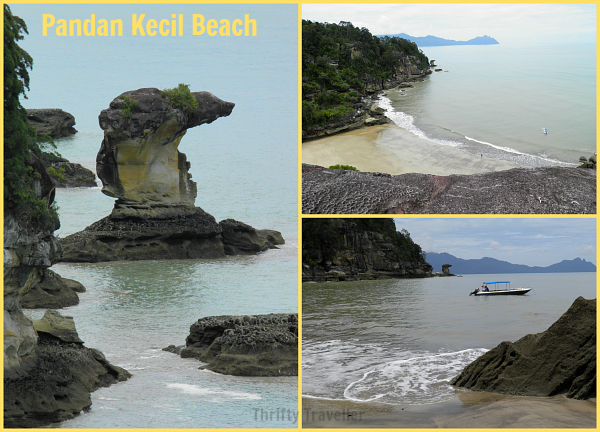 It is only 37km from Kuching, making it easily accessible for day-trippers. Getting there is part of the fun. I took a public bus to Kampung Bako and was dropped off right in front of the National Parks Boat Ticketing Counter. Here I chartered a small speed boat (with driver) for a 20-30 minute boat ride through a wide but shallow estuary and then out into the open sea before being deposited on a beach (Telok Assam) where the Park HQ is located. Before catching the boat you can read a slightly concerning poster about crocodile attacks in Sarawak with a gruesome photo of dismembered human legs being removed from the stomach of a dead croc. Apparently there are 4.2 crocodile attacks per year in Sarawak and this number is increasing. Over half the attacks are in the Batang Lupar River Basin which I must make a note of not visiting. Within minutes of arriving at Bako I saw more wildlife than I have seen in any other Malaysian national park. This family of Bornean bearded pigs was waiting for me on the beach. I’m a bit wary of wild boars but these guys did not seem concerned by humans and carried on making sandcastles. Nearby a group of proboscis monkeys were wandering about. There are a number of well marked and maintained trails within the park. I opted for the relatively straightforward Telok Pandan Kecil trail, which, at 5km and 3 hours round trip, would get me back to the Park HQ in time for my rendezvous with the boat driver. 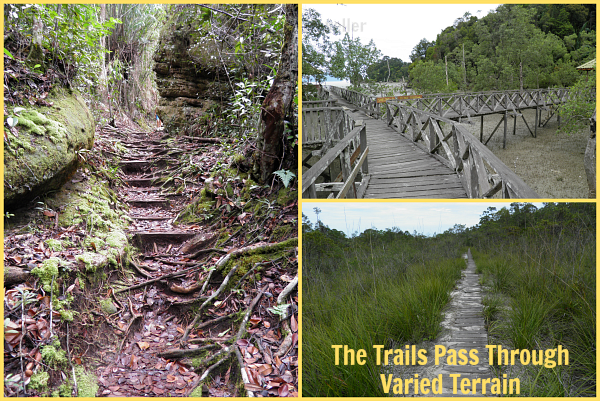 After the mangrove boardwalk at Telok Assam, the trail ascends through thick forest before reaching a plateau covered in scrub vegetation. The path continues along a sandy track lined with carnivorous pitcher plants, before emerging onto a cliff top overlooking the stunning and secluded bay below. Here you can see the snake-shaped sea stack rock formation just offshore. 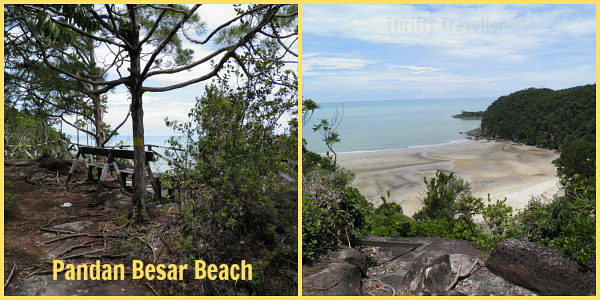 A further 10 minutes descent through thick vegetation and you arrive at one of the best beaches in the park. Some people were swimming but remembering the crocodiles and jellyfish and having no trunks I stayed on dry land. On my way back I made a short detour to Telok Pandan Besar. The path ends on a cliff top overlooking another beautiful bay but there is no path down to the beach which remains inaccessible except by boat. Back at Park HQ there is a good canteen and accommodation for those who want to stay overnight. For safety reasons, you have to register at Park HQ before setting out on a trail and sign back in on returning. Overall I was impressed with the efficient organisation of Sarawak Forestry Corporation which manages all the national parks in Sarawak. They have a good website too.